Most young employees in India aspire to be entrepreneurs. But, walking down the entrepreneurial path can be quite daunting. 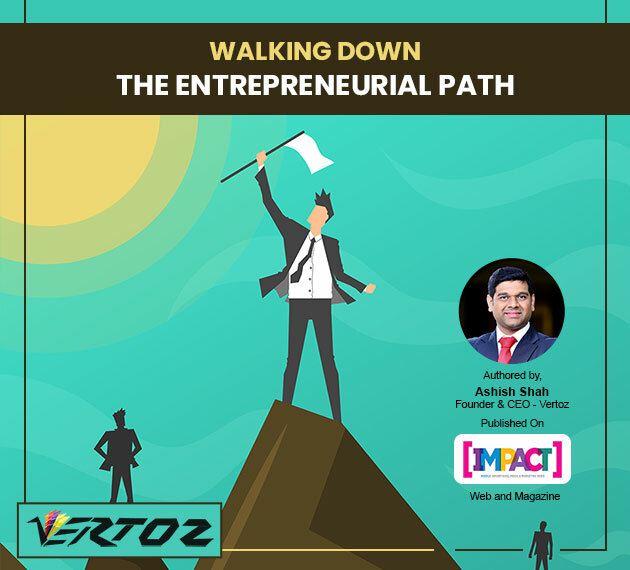 In a candid interaction with Impact Magazine, Ashish Shah (Founder & CEO, Vertoz) walks us through his entrepreneurial journey and shares what makes an entrepreneur successful. Ashish says that having ambition is the first step. That’s where the seeds are sown in the mind. This is the seed that can grow into a huge empire one day. But, that seed has to be nurtured with an active initiative, concrete action and hard work. Along with that, it is also important to have a virtual guru – someone who’s journey will inspire you in the hard times and give you the courage to keep going ahead. He then goes on to cite the example of the one man Ashish himself considers as his virtual guru – the former CEO of General Electric – Mr Jack Welch. He then moves on to elucidate upon us the other building blocks required to build a successful enterprise. The first, an essential and a decisive element is the team. It is crucial to have a strong and reliable core team. The team has to be tenacious enough to stick around in the long-term. The next block is the company’s employees – happy and self-motivated. For this, one has to recognize and appreciate their efforts & dedication. This will increase their productivity and commitment towards work and will go a long way in building a successful company.